A good pair of work boots will do more than just protect your feet. They’ll give you the support and comfort you need to get through the work day with ease. It’s not always easy to find a boot that excels at protection, support and comfort, but the Wolverine W02421 Raider Boot is a major exception. Made from rich brown full grain leather, these boots are durable, comfortable and flexible. Let’s take a closer look at the technology behind the Raider Boot to see what sets it apart from its competitors. The Wolverine Raider Boot features the brand’s Multishox technology for the ultimate in comfort. If you’re on your feet all day, you know just how important it is to have a pair of comfortable boots. With a comfort flex arch, these shoes deliver that extra support you need to stay comfortable all day. We also love the compression pads on the bottom of the soles. These absorb shock and actually return energy, so they’re comfortable to wear all day long. At 5 pounds, these boots are a little on the heavy side, but that’s to be expected with boots of this quality. With the additional support and comfort technologies built into these shoes, you’ll never notice the weight. The Raider Boot is flexible for maximum performance. We get full range of motion with these shoes, which is something you won’t find with other work boots. Wolverine designed this technology to ensure that the shoes move with your foot naturally. Work boots, leather ones especially, tend to be very stiff and difficult to break in. You spend most of the day fighting against your shoe with each step you take. But we didn’t experience that with the Wolverine Raider boot. They were surprisingly flexible and comfortable to wear for several hours. And if you need additional support, there’s plenty of room to add custom orthotics once you remove the insole. In rugged work environments, comfort isn’t your only concern. You also worry about slips and falls both indoors and outdoors. The Raider Boot’s outsole is abrasion, slip and oil resistant to prevent slips and falls. And the mesh liners will keep moisture under control if you happen to walk through wet surfaces or sweat. Compression pads that absorb shock. Mesh linings for moisture management. Oil, abrasion and slip resistant outsole. Wolverine is a leading name in the work boot industry, so it’s no surprise that this boot has over 400 customer reviews. Users not only love the quality of these boots, but the comfort as well. 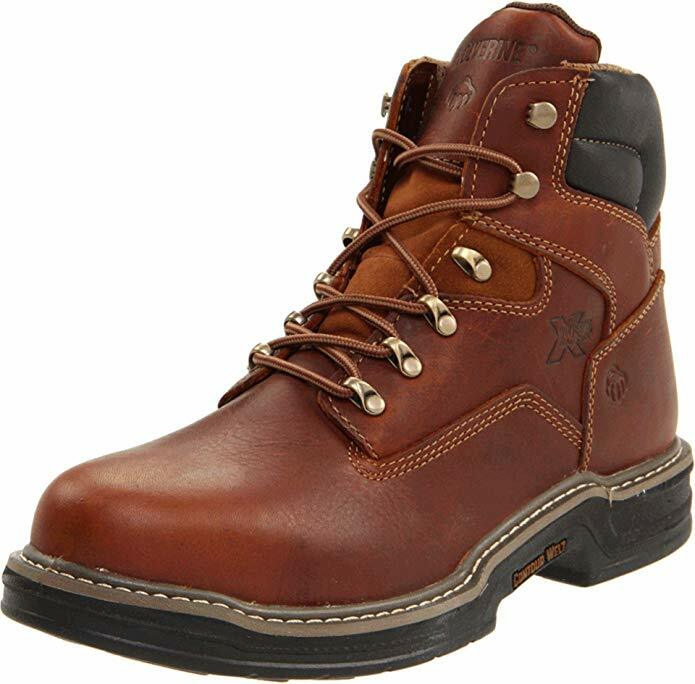 People who spend 10 or more hours at work wear these boots and say they never come home with sore, tired feet. A few users did have one issue with these boots: sizing. A handful of users wound up with boots that were too narrow or small for their feet. This wasn’t a common complaint, so we can only conclude that they just didn’t order the right size. We didn’t experience any issues with sizing. In fact, these boots were just the right size and extremely comfortable. The Wolverine Men’s W02421 Raider Boots are some of the most comfortable boots we’ve had the pleasure of wearing. And we’re not the only ones that feel this way. Hundreds of people wear these boots to work every single day. With a quality, flexible construction, these are the boots you want on your feet if you’re working ten or more hours per day. Just pay close attention to the sizing chart to make sure you buy the right size.